Have you seen the latest exhibition at Museum MACAN yet? 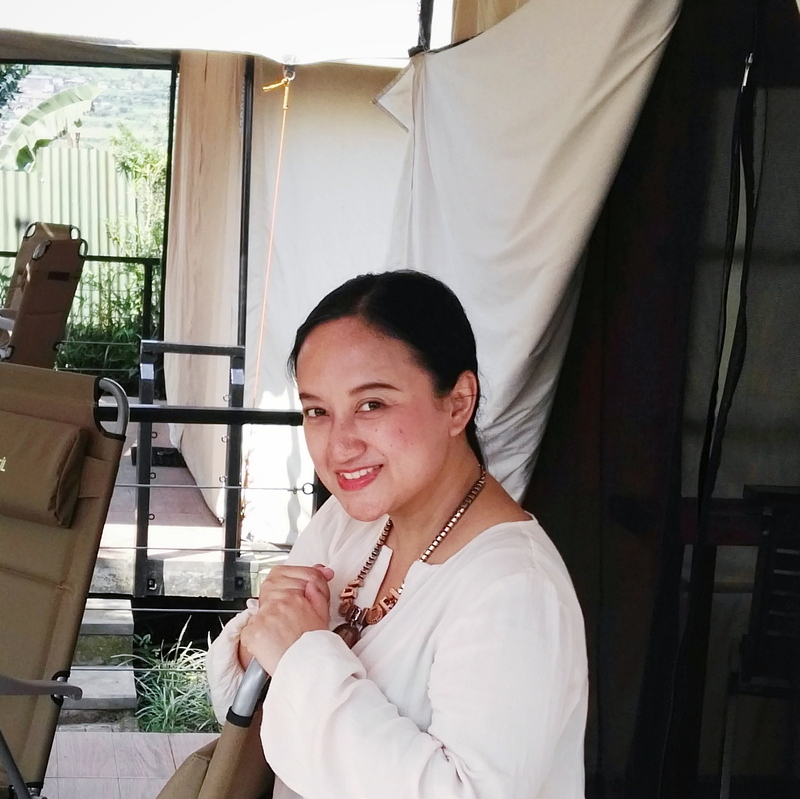 As it kicked-off in mid-November 2018 when many of us were preparing for the year-end holiday, weekends in mid-to late January could be the right time to finally pay a visit. Lee Mingwei, one of three contemporary artists exhibiting their works at MACAN, will perform the highly anticipated phase two and three of his large-scale installation Guernica in Sand on Jan. 19. Mingwei told The Jakarta Post that the first phase of Guernica in Sand started on Nov. 17, 2018, and would end on Jan. 19 in the morning. “[The installation] is larger than life, meaning larger than the actual Picasso painting the Guernica [from which the installation draws inspiration]. We use about 9 tons of sand and we work with a lot of students and staff members here to create [the sand installation] over the course of 12 days. And if you add up the time, that’s about 1,200 hours building the sand painting,” Mingwei said. Although the sand installation already makes an attractive artwork to observe, Mingwei intentionally keeps it at around 95 percent complete. The remaining 5 percent is left unfinished, marked with a few bags of sand. The Paris-and New York-based artist went on to say that the second phase of the installation would begin at 12 noon on Jan. 19, when he would finish the final 5 percent. At the same time, a visitor will be invited to walk on the sand painting. The audience will have the chance to take turns walking on the sand painting. “So that is a continuation; the third person, the fourth person, the fifth person [walking on the sand] — very similar to the actual bombing of Guernica [a town in the autonomous Basque Country in Spain] in 1937 by German airplanes,” Mingwei said, revealing another story behind the installation. He said that the flow of people taking turns to walk on the sand is similar that of the German airplanes that bombed Guernica from sunrise to sunset. The last person to walk on the sand will do so when the sun sets. The third phase, which is the final phase of the installation, starts when the sun sets on Jan. 19. 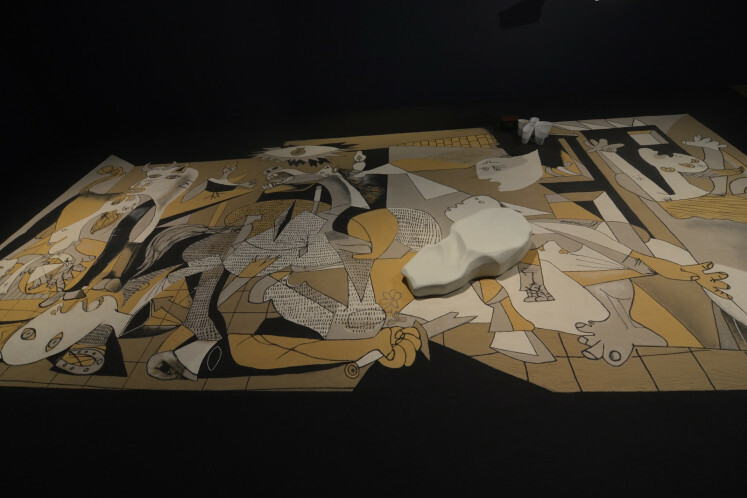 Guernica in Sand would look as if a hurricane just passed at the beginning of the final phase, and then Mingwei along with four audience members and three assistants will brush away the sand using brooms, creating a very different visual to it. Mingwei, who has been exhibiting Guernica in Sands in different cities across the globe since 2006, said he had a different understanding of the work from time to time, and that he could also understand this work through people who had participated in the performance, even though it’s his own creation. An equally interesting story is behind Mingwei’s The Mending Project, which is part of Seven Stories, a project that binds all his seven pieces showcased at Museum MACAN this season. 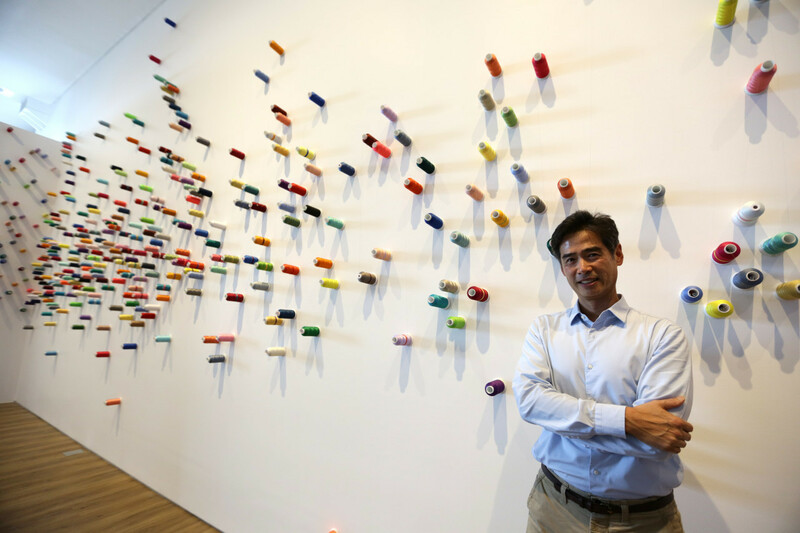 The Mending Project, featuring volunteer menders recruited from a local community who mend visitors’ clothes on a long table in the museum, began with Mingwei’s personal experience of 9/11, the terrorist attack on New York, the United States, in 2001. His partner’s office was located in the World Trade Center’s North Tower. “When the airplane hit, […] fortunately he wasn’t in the office at that time, but I didn’t know because the [phone] lines were broken. I thought he was no longer with us, so I went home and took out everything that need to be repaired,” Mingwei recalled. He didn’t know how long he was repairing things, until he heard the key turn in their apartment and he realized that it was his partner. Mingwei’s partner stood there as the door opened. He was covered in ash and he had brought with him six strangers who were also covered in ash, blood and torn and burnt clothes and had nowhere to go. The six strangers ended up staying with Mingwei and his partner for two weeks, and about nine years later The Mending Project was made. “[…] I want people to see the beauty of what we could do for each other as strangers and not constantly think of what happened, what horrible thing happened and blame people. Let’s move on and celebrate that we’re all still here; you’re still here to be kind to each other, so let me give you the gift of repairing your clothes. And that’s it; it’s very simple,” Mingwei said. While Mingwei’s Seven Stories presentation alongside Arahmaiani’s The Past Has Not Passed and On Kawara’s One Million Years will be on display until March 10, art enthusiasts might like to come before Jan. 19 to see the first phase of Guernica in Sand prior to its transformation starting at noon the same day.